In order to fulfill the demands of our esteemed clients, we are engaged in providing an optimum quality array of Wooden Double Bed. 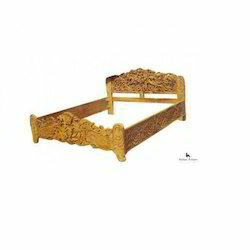 - Specially designed to give Royal touch to your bedroom, this is fantabulous handcarved wooden bed with appealing prints. Available in elaborate designs and sizes. Size: Queen Size. King Size. Californian King Size. Single Bed. Double Bed. We are ranked amongst the most trusted firms deeply engaged in offering a wide range of Wooden Bed. 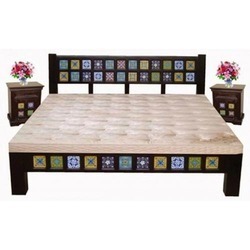 With sincerity and hard work of our professionals, we have carved a niche for ourselves in this domain by providing a premium quality gamut of Double Wooden Bed. Large and spacious bed which is both decorative and durable. It is beautifully handcrafted and reflects exquisite craftsmanship. Antique wooden bed, recreating the magic of good old days. These replica furniture is crafted by our skilled craftsmen to present it a eye-catching look. Wood Used : Sesame, Mango and Acacia.